Several months ago there was a brief furor when the New York Times leaked the final draft of the upcoming Climate Science Special Report (CSSR), which is extremely alarmist. The CSSR is being prepared by the federal Global Change Research Program (USGCRP) and has been in the works for several years, mostly under Obama and still staffed by diehard alarmists. The USGCRP consists of the 13 federal agencies that do climate science and it was speculated that one of these, especially the EPA under Pruitt, might block the CSSR. This has not happened and the Report is now scheduled for release next month. The CSSR is far more alarmist than any IPCC report, as most USGCRP reports have been, thanks in particular to NOAA. It will be an official Federal report. Even worse, the Report is slated to be Volume I of the National Climate Assessment (NCA), which is due out late next year. The NCA is mandated by law, which gives the CSSR even more status as federal policy. It would be ironic indeed if the skeptical Trump Administration were to simply issue this alarmist report as federal policy on climate change science. In fact it would be tragic, a major defeat for climate realism and sound science. But there is a simple way to turn this looming defeat into a major victory. The solution is to do an official Red Team critique of the CSSR. The Red Team concept has been under discussion for some time now, including being endorsed by EPA Administrator Pruitt and Energy Secretary Perry. Some useful background and online discussion are available on Judith Curry’s skeptical blog here and here. The alarmist CSSR cannot be put back into its political bottle. But it is the perfect vehicle for criticism, precisely because of its radical alarmist nature. Most importantly, this criticism would be official, which will make climate skepticism official US policy. Mind you the CSSR is over 600 pages long so its rebuttal is not a trivial exercise. On the other hand, only the most central claims need to be refuted. In particular there are a number of cases of so-called “high confidence” in important assertions that are actually nothing more than highly speculative alarmist dogma. This is especially true of the groundless attribution of human activities causing bad weather. The Red Team critique must be comprehensive, clear and coherent if it is to be effective. Making such a rebuttal official would go a long way toward putting federal policy on the right track, which is that the scientific debate is very real and far from being resolved. In particular, draconian actions like hefty carbon taxes and forced lifestyle changes are simply not justified. There is no need to break new scientific ground. It is just a matter of clearly stating what is already known. Skepticism is sound science. In fact simply visibly starting an official Red Team exercise will go a long way toward blunting the rampant CSSR alarmism. But this must be done soon after the CSSR is officially released. If not then the CSSR is likely to become the official US standard bearer for the alarmist version of climate science. That would be a truly tragic outcome. 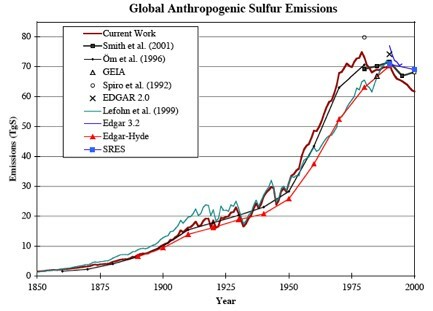 1) Rising CO2 ‘warms’. – 1940-76 cooling as CO2 rose is a full-stop red flag. 2) Solar activity changes are negligible. – Rising and high TSI drives warming. 1) the mechanism here is well understood. huge quantities of aerosol pollution during and post war caused a cooling effect sufficient to counteract CO2 action in that period. They also caused widespread ill health and environmental damage so they were controlled in the 70s. As they were, and as CO2 emissions increased, the temperature began to rise, as predicted by 44 papers in the late 60s and 70s (vs 7 that incorrectly predicted ongoing cooling). Temperatures rose since 1970 without any increase in solar output. The reason for the rise in temperature was therefore not due to the sun as that input stayed constant. It was rising CO2.